Israeli President Rivlin meets the Babi Yar Holocaust Memorial Center delegation. 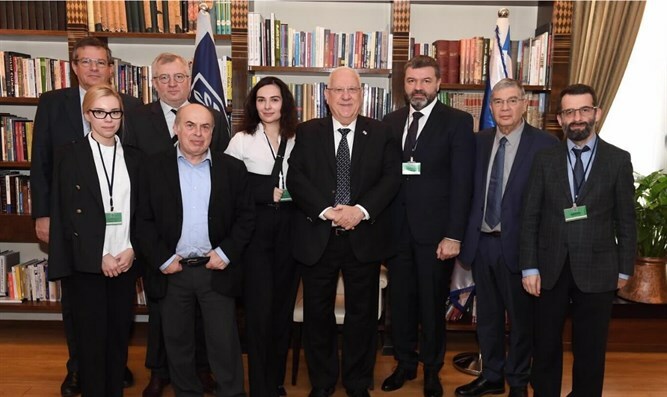 President Reuven Rivlin met with a delegation from the Babi Yar Holocaust Memorial Center (BYHMC) during an official visit Thursday. During the meeting, President Rivlin expressed his support for the creation of a memorial complex in honor of the Babi Yar victims and stressed the importance of preserving historical memory. "Last week I was In Thessaloniki to lay the cornerstone of the new Holocaust Museum together with the Prime Minister of Greece," Rivlin said. "There are symbolic stations to all what happened to the Jewish people over the last 200 years, and especially during the Holocaust." "Thessaloniki is one of them, Babi Yar is one of them, of course the Warsaw Ghetto and the concentration camps. "It is a pleasure to meet all of you, because this is something so necessary. The new generations, even the current generation, they don’t know exactly what happened all over, and this is so important - everything Yad Vashem is doing. I tell every head of state I meet with that Israel is not compensation for the Holocaust - my family came here 210 years ago - but it is important to let everyone know that the Holocaust is a milestone in our lives and in our history, and Babi Yar is something that must be remembered when we talk about all the things we have been through as a nation." One of BYHMC's main tasks is to show the danger of totalitarian, extremist nationalist, and racist ideologies, and especially to show how it all began. And in contrast, to celebrate cultural, ethnic, religious and social differences. Director for International Affairs Marek Siwiec said, "In a world where extremism grows stronger, it is our goal not only to build a Center, but to create a space that will form such a consciousness, with which it will become impossible to repeat the tragedies of World War II." The project aims to pay tribute to all the victims, to tell the story of their lives, and to become a research center specializing in Holocaust crimes in Ukraine and Eastern Europe. "I am sure that the implementation of the BYHMC project will not only change the historical consciousness of Ukraine, but, given the great interest and attention in the world to the problems of the Babi Yar, it will undoubtedly become one of the significant events in the life of the international community," BYHMC COO Yana Barinova said. "Ukraine remains a blind spot on the map of the Holocaust memorials," BYHMC CEO Gennadii Verbylenko emphasized. "Our goal is not about construction but it is about building trust. We intend to be a community building institution. BYHMC is about remembering the past and building the future." The BYHMC delegation also met with Yad Vashem Chairman Avner Shalev and Dr. Arkadi Zeltser, a researcher at Yad Vashem's International Institute for Holocaust Research, who also sits on the BYHMC Committee of Reviewers. Zeltser remarked, "It is very important to maintain a historically accurate and balanced representation of the events during this very complicated period during the Second World War. Between September 29-30, 1941, 33,700 Jews from Kiev were murdered by German Nazis at Babi Yar." "Babi Yar is one of the main symbols of the Holocaust in Ukraine and Eastern Europe."